Brown Soda Bread and Homemade Butter ~ this traditional Irish soda bread is made with a few simple ingredients ~ no yeast, and no kneading ~ and it bakes up into an gorgeous crusty artisan loaf. Pair it with my easy homemade butter and you've got an epic treat! Weigh out your flour or lightly spoon flours into dry measuring cups; level with a knife. Combine flours, baking soda, and salt in a large bowl; stir with a whisk. Make a well in center of mixture. Add buttermilk to flour mixture; stir until blended (dough will be sticky). Turn dough out onto a generously floured surface; knead lightly 4 to 5 times. Shape dough into an 8-inch round loaf; place on a baking sheet coated with cooking spray. Cut a 1/4-inch-deep X in the top of the dough. Bake at 450F for 15 minutes. Reduce oven temperature to 400° (do not remove bread from oven); bake 15 minutes or until loaf sounds hollow when tapped. Cool on a wire rack. Put the heavy cream in a bowl and beat it as you would for whipped cream. Only keep beating. As you go, you will reach the regular whipped cream stage, then it will go beyond that into a kind of overly thick stage, and finally into a seperated state of curds and whey. Add a sprinkling of salt at this time. Drain the butter in a cheesecloth lined strainer for a few minutes, and then pick up the cheesecloth and squeeze out as much liquid as you can from the butter. That leftover liquid is buttermilk, save it to make scones! 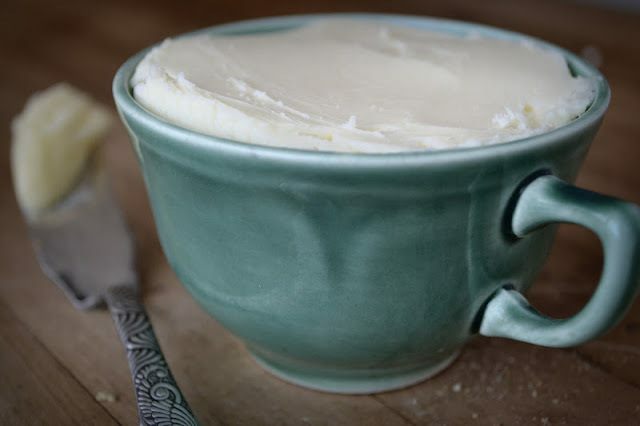 Transfer the butter into a container, smooth it down, and store.